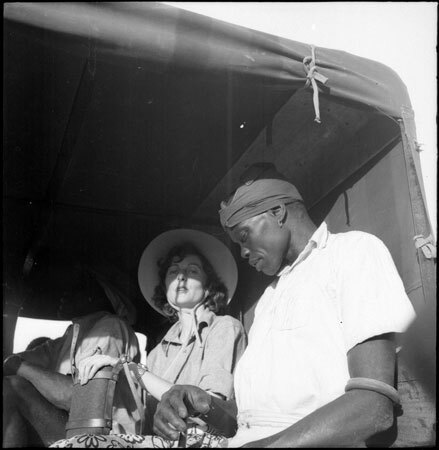 Jean Buxton (holding her water bottle) and two Mandari men sitting in the covered back of a Land Rover during her fieldwork. It is possible that this image was taken by Godfrey Lienhardt who visited Buxton during her fieldwork in 1950. Morton, Chris. "Jean Buxton with Mandari men in jeep" Southern Sudan Project (in development). 03 Jan. 2006. Pitt Rivers Museum. <http://southernsudan.prm.ox.ac.uk/details/1998.97.567/>.